Bias binding is a finish used on seams of woven fabric, most commonly on necklines and armholes. It offers a clean and easy option for finishing your seams and can be used in creative ways to create interest in a garment. Bias binding is made by cutting strips of woven fabric along the bias. The fabric bias lies at a 45 degree angle to the fabric selvedge and has the greatest amount of stretch. The stretch within bias binding allows it to be smoothly applied around curved edges. Use our bias pattern template to make bias binding that is 2.5cm wide. Align the grainline of the bias template with the bias of your fabric. 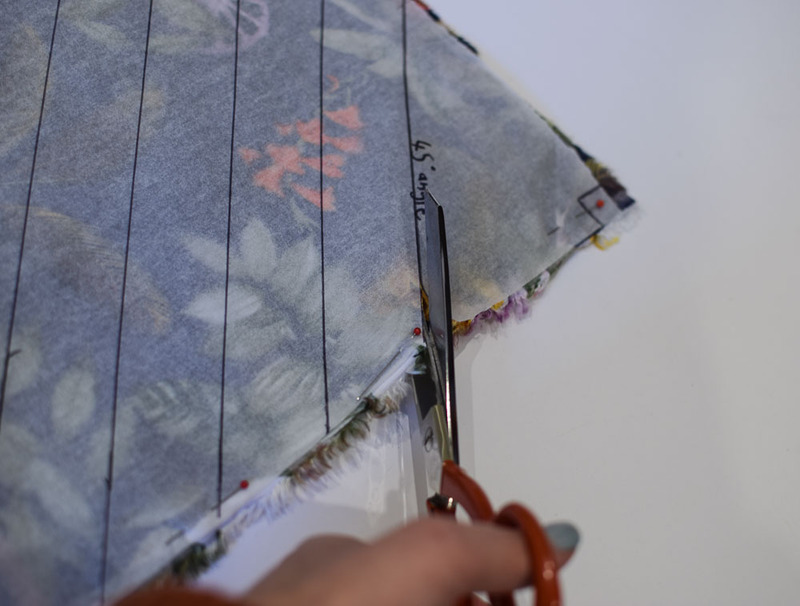 Use a long ruler to extend the long edge of the template to the edges of your fabric. Trace or cut around the template and create as many strips as you want. (This method is best for slippery fabrics but can be used on any fabrics. This is my prefered method). On a large piece of square paper, the same size as the fabric you intend to cut, find the 45 degree angle by folding the square diagonally in half. The foldline is the bias. Draw lines parallel to the foldline. The distance between the lines will determine the width of your bias binding - but don't forget to include 6mm (1/4 inch) of seam allowance on both long sides of the strips. In this example I am creating 2.5cm width bias binding therefore the distance between my diagonal lines is 3.7cm. Lay the paper over your fabric, pinning one side of the square to the fabric selvedge first. Then use lots of pins to attach the paper to the fabric securely. This is important as it will prevent the fabric from slipping around when you cut it. The more slippery the fabric, the more pins you will need. Cut as many strips as you need. Trim the ends of the strips so that they are squared off. In order to create continuous lengths of bias tape, the strips will be stitched together. With right sides together, align the ends of the strips perpendicular to each other. Stitch the strips together at a 45 degree angle as shown by the blue pen in the image above. Trim the seam allowance to a scant 3-4mm (1/8"). Repeat the above steps until the length of bias tape your require has been made. Press each long edge of the bias strips towards the centre to get it ready for applying to a garment. Your bias tape is now ready to be used. Happy making!